First of all Congratulation for 71st independence day. We are proud be an Indian. Today we get a special energy and feeling very happy. It is the day when our ancestor get rid off from the British and become freedom. 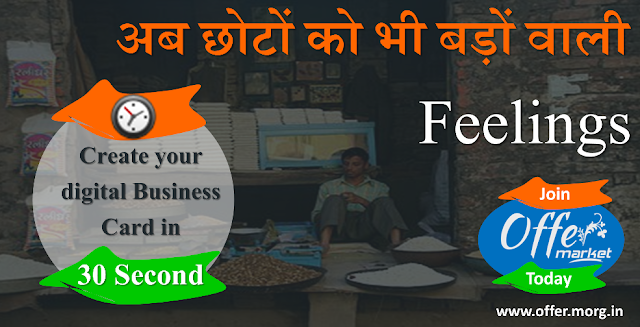 We this day is day of FREEDOM We means OfferPlant Technologies Pvt Ltd also decided to lunch a FREE platform for all businessmen and professionals. Ya we want to say we are ready with the a FREE platform for all i.e; OFFER MARKET. The main purpose behind this online platform to provide a common place and competitive market for local business man. Our main aim to attract the customer in mass and provide them a quality services in competitive prices. A lots of tools are also available for business man to chech their performmance and two way communication. Rating, Voting, Comment, Direct mail, Feedback form, Contact Form, Share tools are integral part of this platform. We Think you visit the the platform register to day the enjoy the power of Offer Market. If you have any suggestion in your mind regarding this platform, business, idea, kindly don't forget to comment below. The full form of OTP is One Time Password. Now a day to secure your data it is used by so many organizations like bank, taxation department, verification department etc. 2. How OTP is used? To secure your data after or before login OTP is sent to verify the user who is going to login. OTP (One Time Password) is sent to given mobile / email id or both before login. User get at least 4 digits’ alpha numeric number which is asked by the portal to verify the identity. Example: When you are going to pay via internet / mobile banking the operator (bank) will sent OTP in your mobile to conform the payment. If any other person got your userid and password, then OTP will block the person access the portal or break the transaction. 3. What is other security option except OTP? In the emerging field of information technologies to secure your account biometrics, face lock etc other option is also available but these are most expensive. Welcome again in OfferPlant, here we will discuss on some basic fact about how to start a successful business. Today we are ready to discuss a very interesting segment of any business. All businessman wan't to create this and that is BRAND or LOGO. Ok, we studied various online post and book but don't get the exact and clear meaning category of logo. There is also a misconception about brand name & logo sometime they are used interchangeably. After the analysis we found that there are some basic criteria of logo and brand . First of all, we are going to clear that logo and brand name both are different but some famous company use as per requirement. Brand name is mandatory whereas logo is optional. Brand name : The Style or Modal design used by any company to represent there name either in electronic format or in printed is called brand name. Brand name contains the name of the company.